The People app groups the dialer, call log, contacts, favorites and groups in tabs, which can be reordered or removed. A dropdown allows you to filter contacts by source - stored in the phone, coming from an online phonebook or a social network. Individual contact info is displayed in tabs too, a Sense tradition. The first tab shows basic contact info like phone numbers, emails, work info plus individual options for ringtones, blocking the contact and adding them to Private contacts. Private contacts is a discrete option that hides the name and photo of a contact when there's an incoming call. The second tab, Thread lists all communication history between you and the given contact - texts, emails and calls. The third and final tab displays the contact's social networking updates for easy access. Tabs here can be reordered and hidden, too. The dialer on the HTC Desire 820 displays the last call with a contact photo so you can easily redial someone. There's smart dialing that looks for both names and contacts. You can even switch to a regular QWERTY keyboard though you have to do this each time you open the dialer and we still find that the dial pad is quicker, it was invented for a reason after all. There's a Large dial pad mode, which predictably makes the buttons bigger but also displays the full call log behind the pad (instead of just the last call as with the Standard dial pad). When you try to scroll the list, the dial pad gets out of the way. For these reasons we preferred this mode over the Standard. It is just a more user-friendly experience. The HTC Desire 820 can ring louder when it detects it's in a pocket, quiet down when you pick it up and shut up altogether when you flip it over. The Do not disturb mode can mute all notifications (including timers and alarms if you like) on a given schedule with multiple rules, e.g. not on weekends and not on weekdays after 19pm. Only contacts on the exceptions list can get through in case of emergency. Contacts can be added to the blocked list to filter out unwanted calls even outside of Do not disturb mode. If you dial an unknown contact, the dialer can ask you if you want to save it to the phonebook (this is disabled by default). The phablet borrows the BoomSound speakers from the premium One family - two speakers on the front. They put out nice sound though in tuning for audio quality HTC lost some of the loudness. Voice and music levels are very close to the Desire 816. 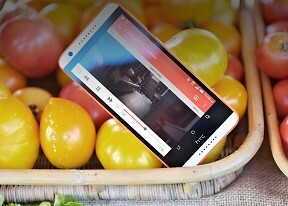 The HTC Desire 820 uses the traditional threaded view for SMS and MMS messages, which share a composer. Some threads can be moved to a "secure box", which requires a password to be opened. There's built-in functionality to block messages from certain numbers, those go in the Block box where you can view them later if you like or set the app to discard them immediately. The look of the app can be tweaked with color schemes and custom backgrounds, font size and how many lines are used for preview in threaded view. The Messages app can also backup and restore messages, so you don't need a third-party app for that. The HTC Desire 820 comes with two email apps - a skinned version of the stock email app and the dedicated Gmail app. The native one has a combined inbox and supports options for peak and off-peak syncing. For both you can have the app check for new mail after a preset periods or use Smart Sync to learn your habits and automatically figure out the best interval. The keyboard offers big, comfortable keys and you can run a calibration tool if you think the default setup slips up. A Swype-like Trace option is available and you can enable bilingual prediction (vital with so many English terms entering every day speech in most languages). Other customization options include switching between layouts (e.g. QWERTY, AZERTY), adding arrow keys (for the portrait keyboard only) and a personal dictionary of words that can be backed up to the microSD card or an email.